How Many Dwarves Does It Take? The light of the fire cast new shadows above the fireplace mantel. Hanging above the mantel, a large head of a giant ferocious looking owl screamed out in silence in The Winter Wolf. Galem and Rhen drank at their table near the fireplace. Starlight quickly joined them as Alina and Circe surveyed the patrons. A group of farmers were gathered around the dwarves raising cups and cheering on their behalf. Kay: The dwarves killed it! Looking back at the animal trophy, Alina and Circe realized this was no giant owl head. 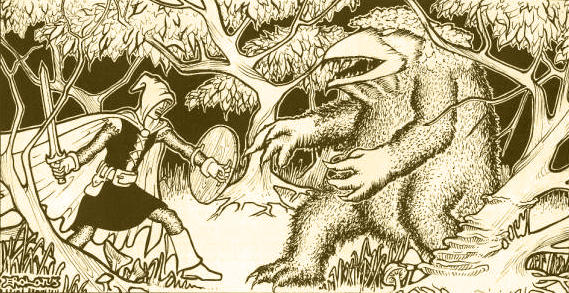 It was the head of an owlbear, slain by the two dwarves. It was the source of farmstead harassments of Eastbrook. The rage in the owlbear’s dead eyes appeared to stare back at the celebrating farmers below it. The girls had never heard of an owlbear. It was fun describing this creature to them for the first time. Starlight: That thing is pretty cool. Galem: Alive, it’ll crush you to death, if you’re not careful. Starlight: Unless you’re too short to crush. Circe went over to Yaen drinking at the bar. Circe: What do you know about the Patriarch? Yaen: He keeps to himself. Rude at times if you ask me. He seems to keep good company with Adessa and Horeth, but maybe that’s just a ruse to convert travelers to Pelor. Circe: He does not serve Pelor. Circe: Did he help build Eastbrook with you? Yaen: No. It was mainly the farmers that helped build Eastbrook. Actually, I would say we helped them, rather than they helped us. It’s a good area, near field, forest and mountain. Circe: When was the temple built? Yaen: Aren’t you a cleric there? Yaen: The temple was constructed about 30 years ago. Built on top of the ruins of one of Alexis’ old towers. But, you’d know more about that than me. Circe: No. Tilith never mentioned it. Circe shared a pitcher of Whip Wine with Alina as they sat in thought. After listening to the dwarves, Starlight shared stories from her travels back in Wyvern Falls. Standing, she pulled her leathers up to reveal her abdomen. Starlight: This bite mark is from the wyvernling I fought. Neat, huh? Downing the rest of his ale, Galem slammed his cup on the table and looked Starlight in the eyes. Galem: I like you. Don’t get yourself killed.